This is an easy to make fajita recipe. 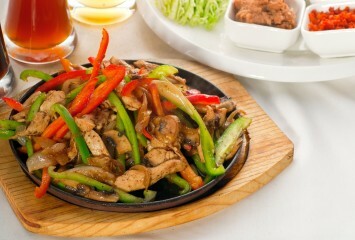 I love chicken fajitas and used to wonder how to get that wonderful flavor that you find in restaurants. Turns out it is quite easy. Just marinate the chicken for a few minutes in a few ingredients then cook it with peppers and onions. Of course the toppings are important. Treat yourself to homemade guacamole and salsa, the guacamole in particular. So easy and so worth it. Place the lime juice, cumin, garlic, cayenne, salt and pepper into a plastic zip bag. Place the chicken in it and zip it, making sure all of the chicken strips are well coated. Let it stand for about 20 minutes or place it in the fridge for up to 2 hours. Heat a large oiled skillet over medium-high heat (see tips below). Add the chicken and stir-fry it until it is lightly browned and the marinade has thickened slightly into a sauce. Remove the chicken. Saute the peppers and onion until they are tender crisp. Return the chicken to the pan. Toss it with the peppers and onions. Sprinkle the chopped cilantro on top. Wrap the chicken and vegetable mixture in flour tortillas. Serve with plenty of grated cheese, sour cream, lettuce, hot sauce, guacamole and salsa. Fantastic and one of the nicest Tex Mex recipes you will find. 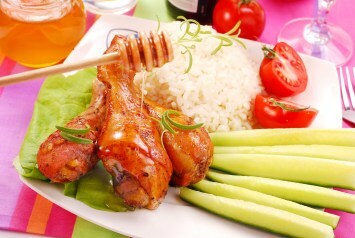 The chicken and vegetables taste even better if they are grilled, either on a barbecue or an indoor grill. If you are not able to use either, don’t worry. Just use a fairly hot frying pan and they will still be fantastic. This is a very healthy recipe just as it is. You can make this recipe even healthier though by using whole grain tortillas. Many recipes that we think of as Mexican recipes are actually Tex Mex recipes, developed in the southern US, not Mexico. This fajita recipe is a good example. There is great controversy over whether they were originally developed in Mexico or the US, but it is commonly agreed that it was in the US. It is thought that beef fajitas were first eaten by cattlemen along the Texas Mexico border. Wherever they come from, I for one am glad I discovered them. Fajitas rule and are one of my favorite things to eat. I would serve this fantastic fajita recipe with our Spanish rice. Just leave out the shrimp. It works perfectly with this the fajitas.